The Chinese believe that during the seventh lunar month, the gates of hells are flung open and all the ghosts are released for a month long vacation. To pacify them, people make all kinds of offerings – food, Chinese opera, puppet shows, pop concerts and other spectacles. Hence the seventh lunar month is known as Ghost Month. The highlight of the celebration falls the 15th day of the 7th lunar month, which is Taoist Zhong Yuan Festival, also known as the Hungry Ghost Festival. It is mainly for worshipping ancestors. 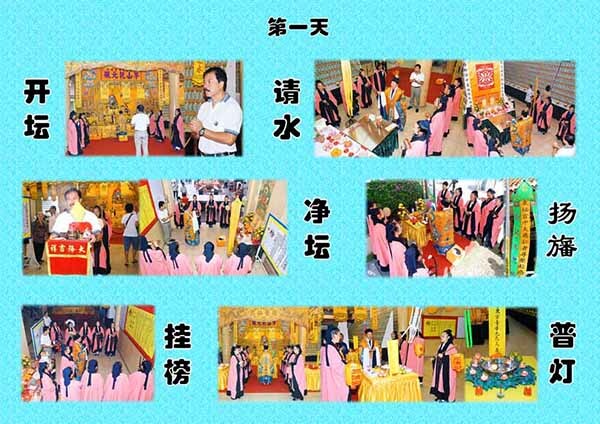 Temples usually conduct Taoist Ritual for the Hungry Ghost in conjunction to the ‘Zhong Yuan Putu” to relieve ghosts from suffering. According to the Taoist cosmology, the three primary elements of the universe are called San Yuan, namely the Heaven, the Earth and the Water. Correspondingly there are three supreme gods named Three Official Emperors, “the Heavenly Official”, “the Earthly Official” and “the Water Official”, whose official birthdays all fall on the full moon night and are respectively named Shang Yuan (also known as the Lantern Festival), Zhong Yuan (also known as the Hungry Ghost festival) and Xia Yuan. The fifteenth day of the seventh month is also the Ullambana Festival in Buddhism. “Ullambana” means “rescuing those who are hanging upside down”. In Chinese, the festival is known as Yu Lan Pen. Yu Lan means to hang upside down and Pen is a container filled with food offerings. The Ullambana Festival finds its roots in a Buddhist text. One day, Maha Mogallana, one of Buddha’s foremost disciples, saw his mother suffering in the realm of hungry ghosts. Using his miraculous power, the filial Maha Mogallana provided a bowl of rice for his mother. However, when the rice reached his mother’s hands, it turned into charcoal and could not be eaten. Upon this, Maha Mogallana could not help but felt sad. Though he could tell what caused the ghosts to receive their retributions, he could not explain his mother’s suffering, so he asked for Buddha’s advice. Buddha told him to “rely on the miraculous powers of the holy monks to help her free from the sufferings. 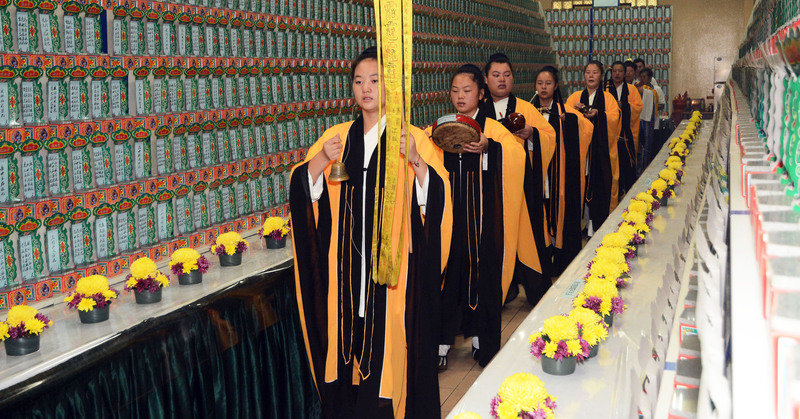 The fifteenth day of the seventh lunar month every year is the last day of summer retreat for all monks, and it is the time to make the offering”. Maha Mogallana carried out Buddha’s instructions and made offerings to all monks on the last day of summer retreat. True enough, his mother was immediately freed from her suffering. He was very grateful to Buddha and praised the beneficence of the Triple Gem. 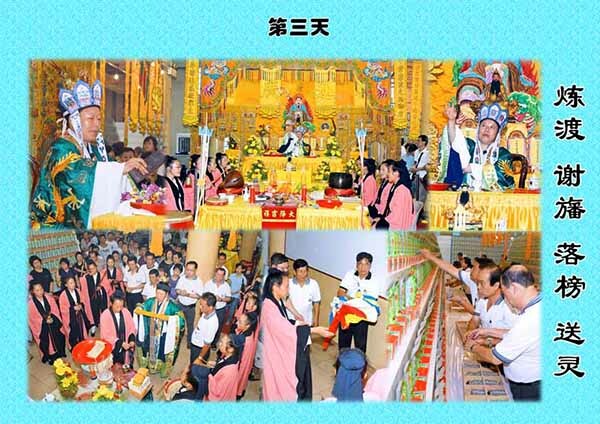 He also urged people to make offerings to the Buddha and the Sangha on the fifteenth day of the seventh lunar month to repay the kindness of their parents. This is a prayer to bless ancestor to be raised to the Heaven. 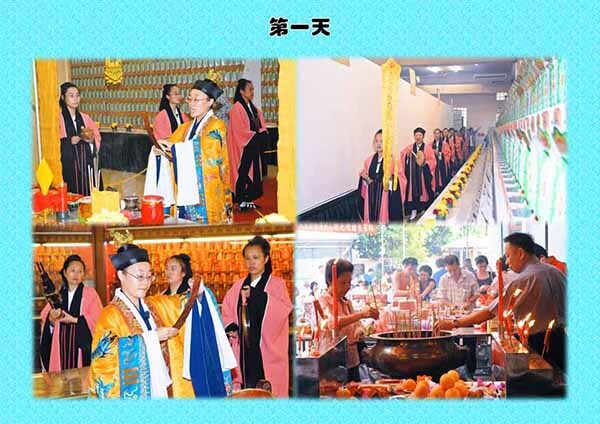 Worshippers remembered ancestors by offering a prayer during this month, praying to bless ancestors to the heavenly place and to the living family members for peace and prosperity. Taoism addressed Tai Shang as Dao Zu or Tai Shang Lao Jun. He was the most mighty God. He lived in a serene Taiji temple. Taoist interpreted as a balance of prosperity and peacefulness of the deceased’s soul in Taoism. He was divided into different category of strength, namely Jade statue, Gold statue and Yellow statue. Traditionally, in the olden days, the army was categorised into various levels. 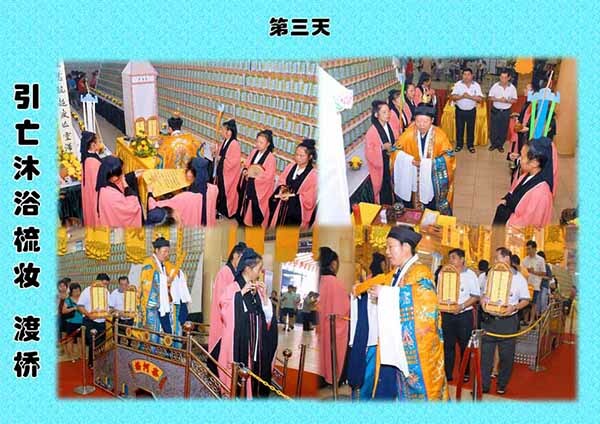 Jade Statue and Gold Statue were used nu the Emperor and his senior officials. The civilian used the Yellow Statue and they were generally used to help in resolving matters relating to the deceased’s soul. Hence, he was used during prayer, with Tai shang as the main God. 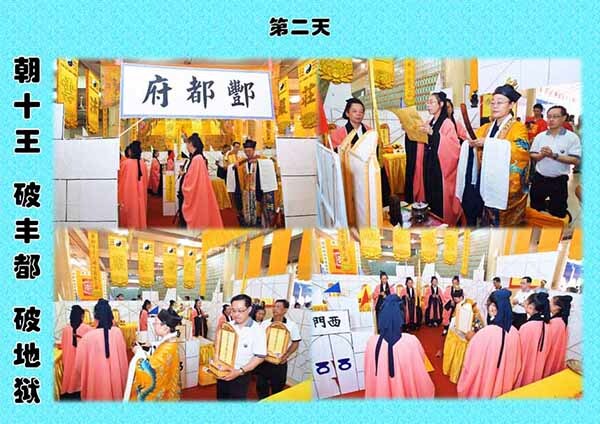 can register at San Qing Gong. Tai Shan Lao Jin Bright Lamp or Lorong Koo Chye Temple Association Bright Lamp. Non-Member : Each tablet at $100 (limit to 3 names). Each additional name at $30, limited to 2 names.